Forward Jordy Kuiper drives to the hoop during a home game against Mercer last season. 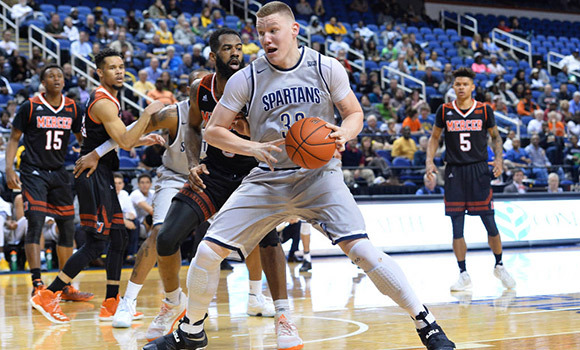 The UNCG men’s and women’s basketball teams have announced their 2017-18 schedules, and this year Spartan fans can expect some tough non-conference competition and exciting home-court action. The men’s team – coming off one of its best seasons in Division I history – will play 17 games at home, including 13 in the Greensboro Coliseum. The squad’s non-conference schedule includes the Nov. 10 season opener at Virginia, as well as road games against Wake Forest and NC State. The women’s team will take on ACC powerhouses Duke and Virginia on the road. Back at home, Spartan fans will have the opportunity to see 15 games at Fleming Gym. Season tickets are now available and can be purchased by calling the UNCG Athletics Ticket Office at 336-334-3250. Season tickets for men’s basketball start at $129 in the lower level, and discounts for faculty and staff are available. All season ticket holders for men’s basketball will receive complimentary season tickets for all 15 women’s basketball home games. To learn more, visit uncgspartans.com. Stay up-to-date throughout the year by following UNCG Athletics on Facebook and Twitter.